Patholab will attend with at the ECP 2018 in Bilbao from 8 to 12 September to show for the first time the new laser printer for slide LPS. 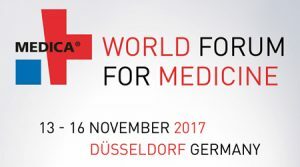 For the fourth year, Patholab will exhibit at MEDICA, the leading international trade fair for the medical sector in Düsseldorf from 12 to 15 November 2018. We are going to show the new laser printer for slide LPS, as well as the new innovative instruments to improve the traceability of anatomic pathology laboratory. You could find us at Hall 18 / B09.